For potential producer partners interested in working with Serrv, please review the following FAQ. Serrv is a nonprofit, fair trade and development organization. Our mission is to eradicate poverty wherever it resides by providing opportunity and support to artisans and farmers worldwide. Serrv works with thousands of small-scale artisans and farmers in Africa, Asia, Latin America and other developing regions of the world by marketing their handcrafts and foods. Through our work, we create economic opportunity so these artisans and farmers can support themselves and their families. In addition to purchasing and marketing products, we collaborate with our partners on other needed tools including product design, training, information and technical assistance. What type of organizations can sell to Serrv? Serrv works directly with organizations who are working with marginalized groups of people throughout the world. Organizations working with Serrv have a mission to socially and economically improve lives and build stronger communities. We only work with organizations which operate according to fair trade principles as defined by the World Fair Trade Organization. 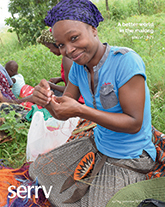 Does a potential organization need to be a member of a fair trade network? A potential partner does not need to be a member of a fair trade network; however, we encourage participation in fair trade groups in-country, regionally, and internationally through the World Fair Trade Organization. What kinds of products does Serrv buy? Serrv buys and sells handcrafts, including home decor, kitchen and tableware, jewelry, and accessories. Serrv also buys specialty food products. We do not buy toys for children. Does a potential partner need to know how to export? Applicants should be established, organized groups with the ability to export. We do not have the capacity to work with groups who do not have any export experience, so we work with groups that have had some experience selling in the international market. A group should have basic knowledge of costing and pricing, production, quality control, documentation, packing, invoicing, delivery, buyer communication, financial management, and accounting. How does Serrv choose partners? Serrv selects partners who meet the criteria outlined in this FAQ. When choosing new groups we evaluate a number of things: the impact the group has in their community, their level of experience, if their products will sell in our market, and if we think that the relationship is sustainable in the long-term. This is determined through an application process which includes a questionnaire, written correspondence, personal discussion, and other due diligence. How many new organizations does Serrv partner with each year? Because we work intensively with groups, and we foster long-term relationships, we only add 1 to 2 new groups each year. This is a very limited number, and unfortunately we often turn away groups that are doing very good work in their communities. How does Serrv work with partners? Our model of working involves developing relationships with organizations that go beyond just purchasing products. As a development organization, we are interested in partnering with organizations to support their growth and to build the skills and capacity that will enable them to provide a dignified income to farmers and artisans into the future. If a group does not currently make a product, can you help start a craft project? Serrv does not have the capacity and resources to assist in starting new handcraft projects. How do I know whether I should request an application packet? Does your organization do more than sell products (like working on health or community projects, training artisans, etc.)? 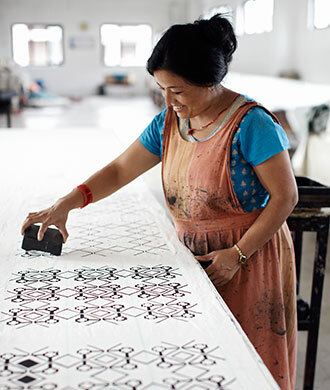 Do you adhere to the practices and principles of fair trade? Do you have products which fit into Serrv's product lines? Do you have the capacity to produce up to hundreds of identical products? Do you have a basic knowledge of export as outlined above? If you answered yes to all of these questions and have reviewed this FAQ, please click here to complete our Artisan Application.